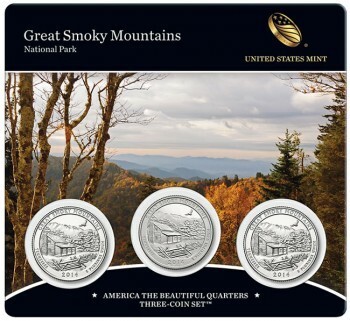 On Tuesday, February 11, 2014, the United States Mint will release the 2014 Great Smoky Mountains National Park Quarters Three-Coin Set. 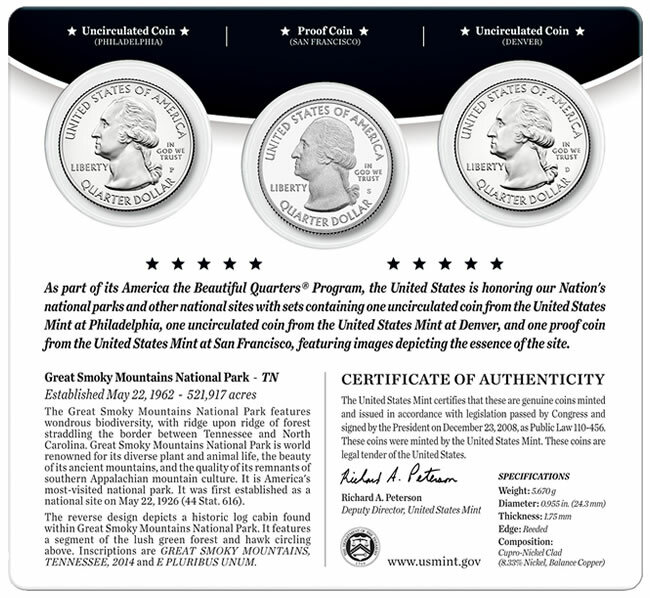 Included in the three-coin set are numismatic versions of the quarter with each struck at a different U.S. Mint facility. Similar circulating-quality Great Smoky Mountains quarters debuted in late January. 2014-P Great Smoky Mountains National Park Quarter in uncirculated quality from the United State Mint facility in Philadelphia. 2014-S Great Smoky Mountains National Park Quarter in proof quality struck at the United States Mint facility in San Francisco. 2014-D Great Smoky Mountains National Park Quarter in uncirculated quality produced at the United States Mint facility in Denver. These three coins are identical to each-other and to the circulating-quality versions, with one major difference — their detail. The two uncirculated coins are struck with greater pressure than their circulating counterparts, typically resulting in enhanced detail. The proof quality coin is also struck at increased pressure but with hand-polished proof blanks and specially polished dies. This results in a coin with a frosted, sculpted foreground and a mirror-like background. The three collector-grade Great Smoky Mountains quarters are attached to a durable presentation card. A photographic image taken in the Great Smoky Mountains National Park appears on the front with a short description of the site on the back. A certificate of authenticity also appears on the back side. 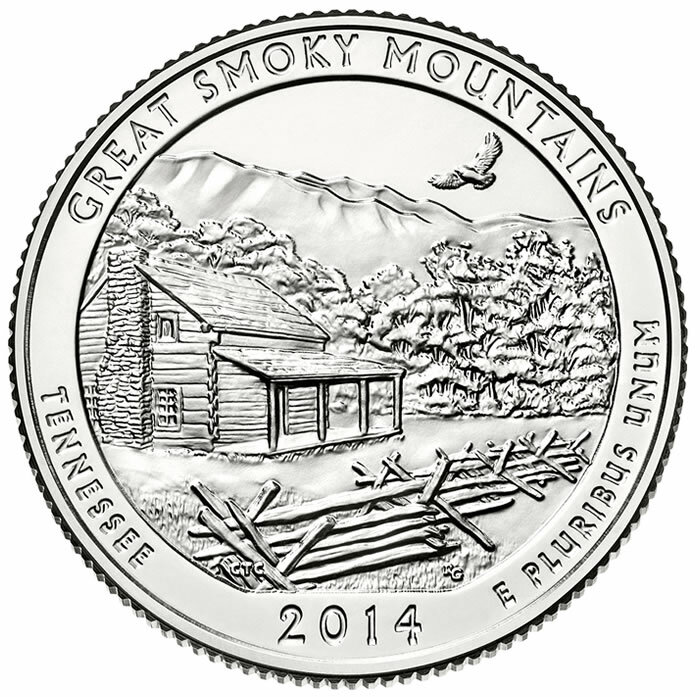 The Great Smoky Mountains quarter marks the first of five 2014-dated quarters to be issued in the US Mint’s America the Beautiful Quarters® Program. The series debuted in 2010 and features five new releases annually with each depicting a different site of national interest from the 50 states, the District of Columbia and the five U.S. territories. Quarters scheduled to appear this year will contain reverse designs honoring Shenandoah National Park of Virginia, Arches National Park of Utah, Great Sand Dunes National Park of Colorado and Everglades National Park of Florida. 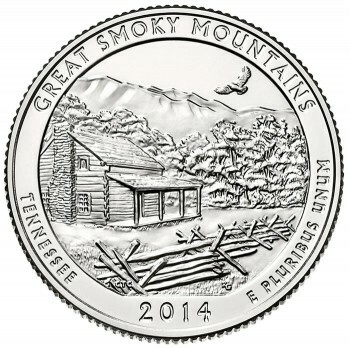 Shown on the reverse of the Great Smoky Mountains National Park Quarter is a depiction of a historic log cabin found within the park. The reverse was designed by United States Mint Artistic Infusion Program (AIP) artist Chris Costello and executed by United States Mint Sculptor-Engraver Renata Gordon. Reverse inscriptions include GREAT SMOKYMOUNTAINS, TENNESSEE, 2014, and E PLURIBUS UNUM. The artist’s and sculptor’s initials appear near the bottom of the image. Each quarter of the America the Beautiful series contains the same basic obverse portrait of George Washington. It is a modified version of the effigy by John Flanagan which has appeared on quarter dollars in the United States since 1932. Obverse inscriptions include UNITED STATES OF AMERICA, LIBERTY, IN GOD WE TRUST, and QUARTER DOLLAR. The Great Smoky Mountains National Park Quarter Three-Coin Set will be available for ordering starting at noon on Tuesday, February 11th, via the U.S. Mint’s online catalog at http://catalog.usmint.gov/ or by telephone by calling 1-800-U.S.A-MINT (872-6468). No product limits are in place. Customer demand will determine the final product mintage.